Lowest prices all the time, guaranteed! If you find a better price, let us know and we will beat it. La Selva is the Spanish word for the jungle. It is a perfect name for this tropical rainforest pattern of green, tan, gold, and muted orange on a black background. The bedskirt and euro shams feature a beautiful basket weave pattern in tan. La Selva Black bedding is proudly made in the USA by Thomasville. Comforter set includes comforter, bedskirt, and 2 standard or king shams (Twin set has only one sham.) Face fabric is 100% cotton. Filled with 100% polyester fiberfill. Dry cleaning is recommended. Tropical foilage and plants in Green, Orange Mist, and Gold displayed on a black background. Comforter set consists of a 66 x 90 inch comforter, a gathered 15 inch drop split corner bedskirt, and one standard sham, 20" x 26" by Thomasville Home Furnishings. Comforter has braided cord edge. Sham has flanged border with braided cord trim. Face fabric is 100% cotton. Filled with 100% polyester fiberfill. Dry clean recommended. Manufacturer UPC is 013864104210. Tropical foilage and plants in Green, Orange Mist, and Gold displayed on a black background. Comforter set consists of an 82 x 90 inch comforter, a gathered 15 inch drop split corner bedskirt, and two standard shams, 20" x 26" by Thomasville Home Furnishings. Comforter has braided cord edge. Sham has flanged border with braided cord trim. Face fabric is 100% cotton. Filled with 100% polyester fiberfill. Dry clean recommended. Manufacturer UPC is 013864104227. Tropical foilage and plants in Green, Orange Mist, and Gold displayed on a black background. Comforter set consists of a 92 x 96 inch comforter, a gathered 15 inch drop split corner bedskirt, and two standard shams, 20" x 26" by Thomasville Home Furnishings. Comforter has braided cord edge. Sham has flanged border with braided cord trim. Face fabric is 100% cotton. Filled with 100% polyester fiberfill. Dry clean recommended. Manufacturer UPC is 013864104234. Tropical foilage and plants in Green, Orange Mist, and Gold displayed on a black background. Comforter set consists of a 92 x 96 inch comforter, a gathered 18 inch drop split corner bedskirt, and two standard shams, 20" x 26" by Thomasville Home Furnishings. Comforter has braided cord edge. Sham has flanged border with braided cord trim. Face fabric is 100% cotton. Filled with 100% polyester fiberfill. Dry clean recommended. Manufacturer UPC is 013864104265. Tropical foilage and plants in Green, Orange Mist, and Gold displayed on a black background. Comforter set consists of a 110 x 96 inch comforter, a gathered 15 inch drop split corner bedskirt, and two king shams, 20" x 36" by Thomasville Home Furnishings. Comforter has braided cord edge. Sham has flanged border with braided cord trim. Face fabric is 100% cotton. Filled with 100% polyester fiberfill. Dry clean recommended. Manufacturer UPC is 013864104241. Tropical foilage and plants in Green, Orange Mist, and Gold displayed on a black background. Comforter set consists of a 110 x 96 inch comforter, a gathered 15 inch drop Cal King split corner bedskirt, and two king shams, 20" x 36" by Thomasville Home Furnishings. Comforter has braided cord edge. Sham has flanged border with braided cord trim. Face fabric is 100% cotton. Filled with 100% polyester fiberfill. Dry clean recommended. Manufacturer UPC is 013864104258. Tropical foilage and plants in Green, Orange Mist, and Gold displayed on a black background. Comforter set consists of a 110 x 96 inch comforter, a gathered 18 inch drop split corner bedskirt, and two king shams, 20" x 36" by Thomasville Home Furnishings. Comforter has braided cord edge. Sham has flanged border with braided cord trim. Face fabric is 100% cotton. Filled with 100% polyester fiberfill. Dry clean recommended. Manufacturer UPC is 013864104272. Tropical foilage and plants in Green, Orange Mist, and Gold displayed on a black background. Comforter set consists of a 110 x 96 inch comforter, a gathered 18 inch drop Cal King split corner bedskirt, and two king shams, 20" x 36" by Thomasville Home Furnishings. Comforter has braided cord edge. Sham has flanged border with braided cord trim. Face fabric is 100% cotton. Filled with 100% polyester fiberfill. Dry clean recommended. Manufacturer UPC is 013864104289. Tropical foilage and plants in Green, Orange Mist, and Gold displayed on a black background. Throw style bedspread. 81" x 110". Face fabric is 100% cotton. Filled with 100% polyester fiberfill. Polyester & cotton backing. 4" diamond quilt pattern. By Thomasville Home Furnishings. Dry clean recommended. Manufacturer UPC is 013864104371. Tropical foilage and plants in Green, Orange Mist, and Gold displayed on a black background. Throw style bedspread. 96" x 110". Face fabric is 100% cotton. Filled with 100% polyester fiberfill. Polyester & cotton backing. 4" diamond quilt pattern. By Thomasville Home Furnishings. Dry clean recommended. Manufacturer UPC is 013864104388. Tropical foilage and plants in Green, Orange Mist, and Gold displayed on a black background. Throw style bedspread. 102" x 118". Face fabric is 100% cotton. Filled with 100% polyester fiberfill. Polyester & cotton backing. 4" diamond quilt pattern. By Thomasville Home Furnishings. Dry clean recommended. Manufacturer UPC is 013864104395. Tropical foilage and plants in Green, Orange Mist, and Gold displayed on a black background. Throw style bedspread. 120" x 118". Face fabric is 100% cotton. Filled with 100% polyester fiberfill. Polyester & cotton backing. 4" diamond quilt pattern. By Thomasville Home Furnishings. Dry clean recommended. Manufacturer UPC is 013864104401. Tropical foilage and plants in Green, Orange Mist, and Gold displayed on a black background. Throw style bedspread. 114" x 118". Face fabric is 100% cotton. Filled with 100% polyester fiberfill. Polyester & cotton backing. 4" diamond quilt pattern. By Thomasville Home Furnishings. Dry clean recommended. Manufacturer UPC is 013864104418. Tropical foilage and plants in Green, Orange Mist, and Gold displayed on a black background. Sham has flanged border with braided cord trim. Quilted interlining for extra body. Envelope closure on back. 20" x 26" By Thomasville Home Furnishings. Face fabric 100% cotton. Dry clean recommended. Dry clean recommended. Manufacturer UPC is 013864104500. Tropical foilage and plants in Green, Orange Mist, and Gold displayed on a black background. Sham has flanged border with braided cord trim. Quilted interlining for extra body. Envelope closure on back. 20" x 36" By Thomasville Home Furnishings. Face fabric 100% cotton. Dry clean recommended. Manufacturer UPC is 013864104517. Gold basketweave print euro sham with flanged edge. 26" x 26". By Thomasville Home Furnishings. Face fabric 100% cotton. Dry clean recommended. Beautifully coordinates with the La Selva tropical print. Manufacturer UPC is 013864104524. The La Selva Black Twin 15" Drop Bedskirt has a golden basket weave print on a gathered 15 inch drop split corner bedskirt by Thomasville Home Furnishings. Made in USA. Dry clean recommended. Manufacturer UPC is 013864104425. The La Selva Black Full 15" Drop Bedskirt has a golden basket weave print on a gathered 15 inch drop split corner bedskirt by Thomasville Home Furnishings. Made in USA. Dry clean recommended. Manufacturer UPC is 013864104432. The La Selva Black Queen 15" Drop Bedskirt has a golden basket weave print on a gathered 15 inch drop split corner bedskirt by Thomasville Home Furnishings. Made in USA. Dry clean recommended. Manufacturer UPC is 013864104449. The La Selva Black Cal King 15" Drop Bedskirt has a golden basket weave print on a gathered 15 inch drop split corner bedskirt by Thomasville Home Furnishings. Made in USA. Dry clean recommended. Manufacturer UPC is 013864104463. The La Selva Black King 15" Drop Bedskirt has a golden basket weave print on a gathered 15 inch drop split corner bedskirt by Thomasville Home Furnishings. Made in USA. Dry clean recommended. Manufacturer UPC is 013864104456. The La Selva Black Queen 18" Drop Bedskirt has a golden basket weave print on a gathered 18 inch drop split corner bedskirt by Thomasville Home Furnishings. Made in USA. Dry clean recommended. Manufacturer UPC is 013864104470. The La Selva Black Cal King 18" Drop Bedskirt has a golden basket weave print on a gathered 18 inch drop split corner bedskirt by Thomasville Home Furnishings. Made in USA. Dry clean recommended. Manufacturer UPC is 013864104494. The La Selva Black King 18" Drop Bedskirt has a golden basket weave print on a gathered 18 inch drop split corner bedskirt by Thomasville Home Furnishings. Made in USA. Dry clean recommended. Manufacturer UPC is 013864104487. 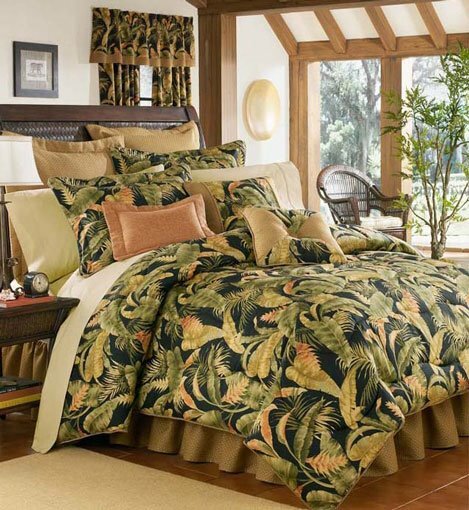 Tropical print on black is framed by corded trim and gold basketweave print on each end. 16" x 20". By Thomasville Home Furnishings. Face fabric is 100% cotton. Filled with 100% polyester fiberfill. Dry clean recommended. Manufacturer UPC is 013864104531. Orange Mist pillow highlights the orange in the La Selva Black tropical print. Flanged border. 16" x 20". By Thomasville Home Furnishings. 66% cotton/ 34% polyester. Polyester fiberfill. Dry clean recommended. Manufacturer UPC is 013864104548. Tropical print on black pairs with gold basketweave print. Center button and cord trim accent. 18" x 18". By Thomasville Home Furnishings. Face fabric is 100% cotton. Filled with 100% polyester fiberfill. Dry clean recommended. Manufacturer UPC is 013864104555. Tropical print in green, orange, and gold on black background, trimmed with gold twisted braid along the scalloped bottom edge. Use alone or inserted between the right and left Empress Swag Valance to cover wider windows. Lined. 52"wide x 16"long plus 2" header. 3" rod pocket. By Thomasville Home Furnishings. Print on 100% cotton duck. Dry clean recommended. Manufacturer UPC is 013864108881. Tropical print on black accented by gold basketweave print at the bottom. 72" x 18" plus 2" header. Lined. 3" rod pocket. By Thomasville Home Furnishings. Face fabric 100% cotton. Dry clean recommended. Manufacturer UPC is 013864104593. Tropical print on black accented by gold basketweave print at the bottom and on the straps. 52" x 20" plus 1" header. Lined. 3" rod pocket. By Thomasville Home Furnishings. Face fabric 100% cotton. Dry clean recommended. Manufacturer UPC is 013864104586. Tropical print in green, orange, and gold on black background, trimmed with gold twisted braid along the scalloped bottom edge. Two piece lined swag. 100"wide x 30"long plus 2" header. 3" rod pocket. By Thomasville Home Furnishings. Print on 100% cotton duck. Dry clean recommended. Manufacturer UPC is 013864108874. Tropical foilage and plants in Green, Orange Mist, and Gold displayed on a black background. 100" x 84" plus 2" header. Lined. 3" rod pocket. By Thomasville Home Furnishings. One pair. Face fabric 100% cotton. Dry clean recommended. Manufacturer UPC is 013864104562. Tropical foilage and plants in Green, Orange Mist, and Gold displayed on a black background. 72" x 75". Unlined. Button holes at top for easy hanging. By Thomasville Home Furnishings. Dry clean recommended. Manufacturer UPC is 013864104609. Basket weave print in natural color on 100% cotton duck. 60" wide. By Thomasville Home Furnishings. Dry clean recommended. Price is per yard, whole yards only. Non-returnable. Manufacturer UPC is 013864104630. Tropical print in green, orange, and gold on black background. Print on 100% cotton duck. By Thomasville Home Furnishings. Dry clean recommended. Price is per yard, whole yards only. Non-returnable. Manufacturer UPC is 013864104616. Orange mist woven fabric. 45% cotton/55% polyester. By Thomasville Home Furnishings. Dry clean recommended. 54" wide. Price is per yard, whole yards only. Non-returnable. Manufacturer UPC is 013864104623.